1. Left to Right - Dan, Sifu Sam Ng, and Instructor Keith Voney (who took home a gold in the full contact fighting division from this year's competition). 6. 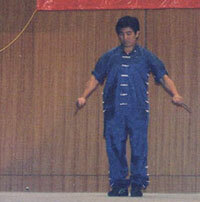 Sifu Sam Ng demonstrating the Choy Lay Fut double daggers. 2. Instructor Joe Keit (from the Lee Koon Hung Choy Lay Fut Association), Instructor Keith Voney, Dan, and Sifu Sam Ng. 7. 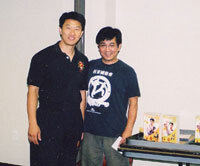 Sifu Sam Ng with his good friend, Sifu Jimmy Wong (the coordinator of Taiji Legacy). 3. 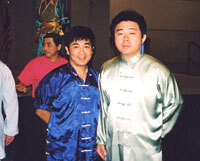 Sifu Benny Meny and Sifu Sam Ng. 8. The masters posing for photos on stage after the demonstration. 4. 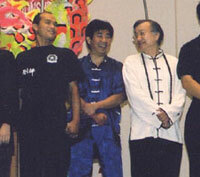 A Sifu group photo during the masters' demonstration. 9. Steve Wang (who took silver in Choy Lay Fut forms from this year's competition) with Sifu Sam Ng. 5. A group photo taken before the competition. 10. 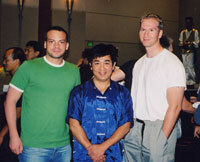 Three handsome martial artists.